In devout Catholic circles 50 years ago, Anne Catherine Emmerich (1774-1824), a German mystic and stigmatic, was a well-known and revered figure. She was later all but forgotten by most people until last fall, when Mel Gibson mentioned in an interview that her book on Christ’s Passion had influenced him and his new film, “The Passion of the Christ.” Gibson thus turned the spotlight on her again, which helped bring to light the news that she will probably be beatified early next year. According to her biographer, as a child Catherine received visitations from Jesus and John the Baptist, who appeared to her as children like herself. In 1799, shortly after she entered the Augustinian convent in Dülmen, near her birthplace in Westphalia, she began to bleed from a ringlet of tiny wounds around her head and three years later exhibited the stigmata on her hands, feet and side. She became so weak and sickly that after 1813 she rarely left her bed. For the last 10 years of her life she lived exclusively on water and holy Communion. Both ecclesiastical and civil officials were suspicious and on several occasions conducted rigorous examinations of her and her circumstances. They found no evidence of deception. After she died, her body remained supple for several days before her burial, and when it was exhumed six weeks later, to make sure her followers had not stolen it, it was found to be free of corruption and odor. Although these phenomena helped make Catherine known and venerated locally, what made her famous worldwide were what were called her visions. These, as presented in the books attributed to her, are not so much visions as eye-witness accounts of events and personages of the Old and New Testaments and especially of the lives of Mary and Jesus. Emmerich seemed to have the gift of being transported back in time, which enabled her to supply information and details missing from the biblical accounts. Only modestly educated, she never attempted to write down what she experienced, but she won the interest and admiration of the German Romantic poet Clemens Brentano. From 1818 until Emmerich’s death, Brentano sat frequently by her bedside and took down the words Catherine spoke during her ecstatic transports. Nine years after her death, Brentano published The Dolorous Passion of Our Lord Jesus Christ After the Meditations of Anne Catherine Emmerich. This is the book to which Mel Gibson referred, which in English translation runs to some 350 pages of relatively small print. Even in translation its literary quality is apparent, but its detail and the stories behind the story are what make it engaging. In his introduction Brentano maintained that Catherine possessed, as a gift from God, an intuitive knowledge of the Bible. Between 1858 and 1860, Carl E. Schmöger, a German Redemptorist priest and Catherine’s first biographer, published from Brentano’s journals a four-volume Life of Christ that included all the previously published materials but began with the fall of the angels from paradise and continued through Jesus’ suffering and death, for a total of over 2,000 pages. Once again the reader learns a great deal beyond what the Scriptures reveal—for instance, that the couple whose wedding Jesus and Mary attended at Cana took vows of perpetual chastity immediately after the miracle of the water turned into wine. The reader also learns that because of the curse laid on him by his father, Noah, Ham became the progenitor of “the black, idolatrous, stupid nations” of the world. These four volumes were also an international success, running through many editions. Visitors to the Holy Land who carried Emmerich’s books with them were struck by the accuracy of her descriptions of places and monuments, impossible to explain on a human level for somebody who had never traveled there and had never formally studied the subject. Gibson is only the latest in a list of prominent people who have drawn spiritual nourishment from the Seer of Dülmen, especially from her story of the Passion. The book brought tears to the eyes of the 19th-century Jesuit poet Gerard Manley Hopkins when he heard portions of it read aloud in a Jesuit dining hall, and it helped bring Paul Claudel and Raïssa Maritain into the Catholic Church. In 1892 the cause for Emmerich’s beatification was introduced, a story well told in Kenneth Woodward’s Making Saints (Simon and Schuster, 1990). Difficulties were raised. What credence is to be given accounts that purport to add to the Scriptures? How much of the published texts was attributable to her, and how much to Brentano? Were these simply devout meditations like the imaginative contemplations St. Ignatius recommends in the Spiritual Exercises, as Brentano sometimes suggested, or were they true visions and revelations, which is how he more consistently and passionately presented them? The case generated sharp debate among scholars, which only intensified after 1928, when the Holy Office intervened to call a halt to the process moving toward her canonization because of the seriousness of these questions. The bibliography on the Emmerich “case” is both extensive and impressive. In Germany experts went to work on Brentano’s papers and library and eventually came to the conclusion that only a small portion of what had been published could safely be attributed to Catherine. They found maps, travel books and biblical apocrypha from which Brentano could have supplied information to embellish the texts. We are almost compelled to draw the conclusion that although the texts could be something more, in their present form they are perhaps best treated as devout fiction or, to put it more harshly, as well-intentioned frauds. The official opinion on the writings has thus for a long time been sober and even skeptical. Despite that fact, beatification will almost certainly be interpreted as approval of them. In the public marketplace, Emmerich’s books have continued to be published and sell relatively well. They have experienced something of a boom in the past few months, after Gibson’s reference to her. (Try a search for “Emmerich” on the Internet.) An audio version of The Dolorous Passion became available in February. In its style and approach, that book, like the others, is badly dated, naïve, sometimes ridiculous and sometimes seriously offensive. It is anti-Semitic to the degree (sometimes considerable) that virtually all 19th-century retellings of the Passion, whether by Catholics or Protestants, were anti-Semitic. While it has been helpful to people in the past, I would not recommend it to anyone today. In any case, what is perhaps needed at this point is to rise above current polemic about Mel Gibson’s movie, which has generated polemic about the book, and locate both the movie and the book in the large historical context of Christian spirituality. The Dolorous Passion is the best known and most widely read of the Emmerich-Brentano publications. This should not be surprising, because it supports and promotes a spiritual tradition that developed in the late Middle Ages, principally in northern Europe, and gained great, almost overwhelming momentum in the modern period down to the Second Vatican Council. It is safe to say that during that period many, perhaps most Catholics came to identify more strongly with the Passion than with the Resurrection or any other aspect of Christ’s life. On the walls of every home hung a crucifix, and in Catholic countries crucifixes hung prominently on the walls of every public office. It was not always thus. According to some scholars, the Passion narratives in the Synoptic Gospels are the oldest tradition within them, which indicates the importance the early community attributed to the story of Jesus’ suffering and death. The cross, without a corpus, was perhaps the earliest Christian symbol. Nonetheless, Christian writers from the second century through the 12th do not dwell upon the Passion. None of the Fathers of the Church has a treatise on the sufferings of Christ, nor do we have from them any notable homilies on the topic. The same is true for the flowering of Christian literature in the 12th century, with the brilliant Cistercian abbots like St. Aelred of Rievaulx and St. Bernard. By this time images of Christ on the cross had begun to appear, but they depicted him as reigning from it, not hanging in agony. With the 13th century came momentous cultural shifts. Among them was a new focus on the humanity of Christ. This was the precondition for a growing focus on the Passion. St. Francis of Assisi composed an Office of the Passion, and he is the first person in the history of Christianity known to have borne the stigmata. Even so, his story as told in The Little Flowers, where he is unabashedly portrayed as a Christ-figure, is a story of love, peace and joy in a redeemed world, where even the birds and beasts are affected by the Gospel. During the next two centuries, however, Christian devotion continued to shift towards the Passion, with ever more attention paid to Christ’s physical sufferings. The crucifixion panel of the Isenheim Altarpiece (1515) reflects the gruesome and detailed descriptions of the torments current in literary texts. The meditations on the Passion by the writer known as Pseudo-Bede, composed around the beginning of the 14th century, were among the first in this new genre. Passion plays became popular, as did the Stations of the Cross. A feature common to all these phenomena was the practical neglect of the Resurrection. The Stations of the Cross, for instance, were precisely that. They ended with the placing of Christ in the tomb. Just why this preoccupation with the Passion occurred and became so prevalent is impossible to say. Surely contributing to it were catastrophes like the many epidemics that ravaged Europe in the late Middle Ages, of which the most famous is the Black Death, but they do not altogether explain it. Italy, at least until the middle of the 16th century, was for some reason less caught up in this trend than Germany and northern France. While Italian Renaissance artists of course depicted the crucifixion and other events from the Passion, their more characteristic productions were scenes related to the Incarnation, such as the Annunciation, Nativity, Madonna and Child, and Adoration of the Magi. In the following centuries, devotion to the Passion became ever more characteristic of Catholic piety everywhere, but it gained intensity particularly in the 19th century. The anti-Catholic excesses of the French Revolution and their continued impact on Europe begot a conviction that the world was becoming more sinful by the day and more inimical to Christ and his message. To compensate for these outrages, it was thought, and the hurt they caused Christ, reparation was needed. In a new way Jesus became the Man of Sorrows. Those who most closely resembled him were “victim souls,” who similarly suffered for the sins of the world. As had been true since earliest times, a high point of the liturgical year was Lent. It gradually evolved from a time of special prayer and fasting in preparation for Christian initiation and reconciliation at Easter into a season specially devoted to the Passion of Christ and the misery of the human condition. It began dramatically with the imposition of ashes to remind us that we are dust and unto dust we will return. During Lent church activity notably intensified, with special evening sermons, often on the Passion, and with the Stations of the Cross conducted on Wednesdays and Fridays. In Holy Week the liturgies of the sacred triduum were celebrated early in the morning on Thursday, Friday and Saturday. Sparsely attended, they were little understood or appreciated. The ceremonial high points were therefore elsewhere. The first was the solemn Tenebrae on Wednesday, Thursday and Friday evenings, a special format for praying parts of the Divine Office, marked by lamentations, penitential psalms and the extinguishing one by one of 15 candles; the service ended with the church in total darkness. The second was the Tre Ore, three hours of sermons on Good Friday afternoon or evening on the “seven last words” of Jesus from the cross. Mass on Easter Sunday morning was almost an anticlimax that brought life back to normal. The problem with this emphasis is that it can lead to neglect of the Resurrection. The reform of the Easter triduum that began with Pius XII and continued with the liturgical changes during and after Vatican II was, among other things, an attempt to redress the balance. The emphasis in the council documents on our dignity in Christ and the less pessimistic assessment of our role “here below” were similar attempts. Such emphasis was inspired, directly or indirectly, by recourse to earlier traditions, especially the theology and spirituality of the Fathers of the Church. Despite the legitimacy and, indeed, the power, of the tradition of empathy with the sufferings of Christ as one’s spiritual center, it is not the only, and certainly not the most traditional, expression of Christian spirituality. An older tradition, from the fathers through the Italian Renaissance, put the Passion into the larger picture that begins with the Incarnation and carries through to the Ascension. It is a tradition beautifully exemplified in St. Thomas Aquinas’s Summa Theologiae, Part III, Questions 1 to 59, where the Angelic Doctor moves step by step from the Incarnation to Jesus’ enthronement at the Father’s right hand. In the Spiritual Exercises, St. Ignatius devotes a full “week” to Jesus’ life up to the Passion, a full week to the Passion and then a full week to the risen life. John O'Malley's article "A Movie, a Mystic, A Spiritual Tradition" is incredibly insightful and researched. I've been seeking some information about Sr. Ann Catherine Emmerich and you supplied more than I had intended to read. I recall a Biblical scholar commenting on the Synoptics formed around the Paschal Mystery. Thus, the Gospels are born through those initial traumatic experiences of the early believers. But, the apostles left their confinement of fear when first a woman announced His Rising and second, Christ appeared. When I was healing, I reflected upon an color print image of a Risen Christ upholding a collapsed man, whose hands held a hammer and nails. The Risen Christ's carpenter hands were wounded but his clasping strength gave me hope. The intrigue in this whole Passion of the Christ reflection/movie is that it says more about Mel Gibson than it does about most Christians. I respect Fr. John O'Malley, S.J., as an excellent historian, and having read a couple of his books and several articles by him, I would refrain from pointing out what I consider a real error in his article, except for the fact that almost every comment I have read by priests, in "America" and elsewhere, regarding Mel Gibson's movie on The Passion, has been extremely harsh in its criticism. A movie on such a transcendant subject is scarce indeed, and I should think, would be greeted with overwhelming joy, even while admitting small imperfections. But Fr.O'Malley, adding to the multiple criticims of the movie's cruelty, implies that the crucifix, with Christ's suffering figure, did not appear until the Middle Ages. I was surprised, then, to read in the daily magazine "Magnificat," that St. Paul of Cyprus was martyred in the year 760 A.D., because he refused to trample on the crucifix. It may seem a small error, but it tends to weaken the gist of the whole article. 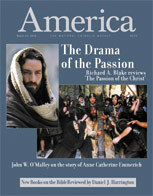 Many thanks for the fine article by John W. O’Malley, S.J., on Anna Katherine Emmerich and the Mel Gibson film (3/15). His historical sketch of the Passion tradition prompts two thoughts regarding the relationship between that tradition and the post-Vatican lI emphasis on the Resurrection. That emphasis makes sense theologically, of course, but liturgically it has generated zingy church songs (I hesitate to call them hymns) in which we Catholics now celebrate ourselves as the finger-snapping “people of God” who, it seems, are so lucky to know that God loves us, thanks to our Resurrection faith. Fortunately, that is hard to do during Passion Week, one of the few times a Catholic is likely to hear a classic hymn in Latin. It also occurs to me that unlike Good Friday, or for that matter the Jewish Day of Atonement, Easter, which (as we might say) celebrates the fact that the “last words” of Jesus on the cross were not God’s last word, must compete with chocolate bunnies, egg-rolls, pagan sunrise services and other insipid rites of spring. Without the somberness of Passiontide, Easter these days would be unbearable, just as Good Friday without Easter would be meaningless. The clear and balanced comments on the movie “The Passion of the Christ” that have appeared in America over the past several weeks have been appreciated (3/8, 15). I find myself in the socially awkward position of not having seen the film and having neither a desire to watch it nor an intention to do so. I am thus left out of many “religious” conversations today. Perhaps my situation arises from my understanding that there is nothing “unique” about the specific mode by which Jesus died; that tens of thousands of humans have been crucified. Yet I also recognize its centrality to our faith, and while I am not drawn to sanitized crucifixes, I have long kept a print of one of Matthias Grunewald’s “gory” crucifixions on my wall to help root me in historical reality. Perhaps also it is my ingrained Jewish cultural unease with the history of Passion plays, which have for centuries fueled and triggered anti-Semitic prejudices and behavior. I am uncomfortable with and generally decline to participate even in the communal Gospel readings at Palm Sunday and Good Friday liturgies. Yet I recognize and appreciate the centrality of the Passion and Crucifixion to the Synoptic and Pauline traditions of our faith. I wonder what sort of catechesis would be effective in inseparably linking the incarnation and life and teaching of Jesus with his death, and linking his resurrection and ascension with his identity and life in the minds of Christians. If the basis of much historical error is an overemphasis on one particular truth to the exclusion of the whole of truth, then despite the orthodoxy of our Catholic faith and the progress made in recent decades, we are still far from effectively communicating and transmitting that salvific truth, both within the church and to others. This article also appeared in print, under the headline "A Movie, a Mystic, a Spiritual Tradition," in the March 15, 2004 issue. John W. O’Malley, S.J., professor of church history at Weston Jesuit School of Theology in Cambridge, Mass. is the author of Trent and All That: Renaming Catholicism in the Early Modern Era (Harvard University Press, 2000).